Arsenal beat Napoli 2-0 at the Emirates Stadium on Thursday in the Europa League quarter-final first-leg tie. Mesut Ozil started the game and played an important role in the opening goal. Aaron Ramsey swapped passes with Mesut Ozil before Alexandre Lacazette and Maitland-Niles combined to set up the Wales international for a classy finish. The Gunners doubled their lead on 25 minutes thanks to Torreira. The playmaker of Turkish origin put on an impressive performance and was given a standing ovation by sections of the fanbase after he was taken off for Alexandre Lacazette on 67 minutes. The Emirates often gets a bad rep when it comes to creating a fiery atmosphere but the fans do deserve credit yesterday. I was seated in the Clock End and must admit that it was one of the best atmospheres I have experienced in an Arsenal home game this season. 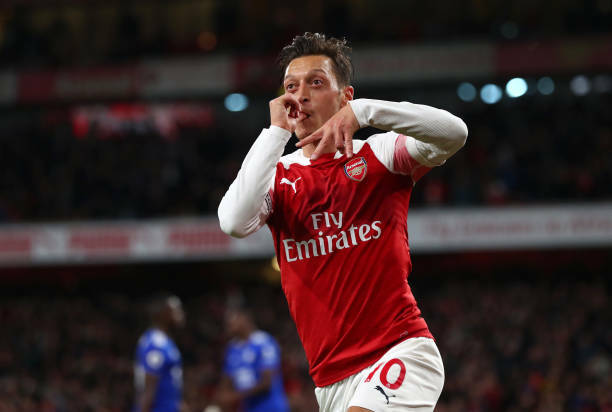 Ozil was a joy to watch from the stands against Napoli last night as was Aaron Ramsey who was named Man of the Match [BBC]. The Gunners take on Watford away next before the second-leg against Napoli next Thursday.